Use alone or in combination with SuperTrace 6% Iron with fulvic acid for a complete foliar fertilizer. 19-0-3 Golf was developed to eliminate the need for tank mixing nitrogen and potash for liquid application. Without specialized equipment, melting dry nitrogen products can be a difficult and time consuming task. 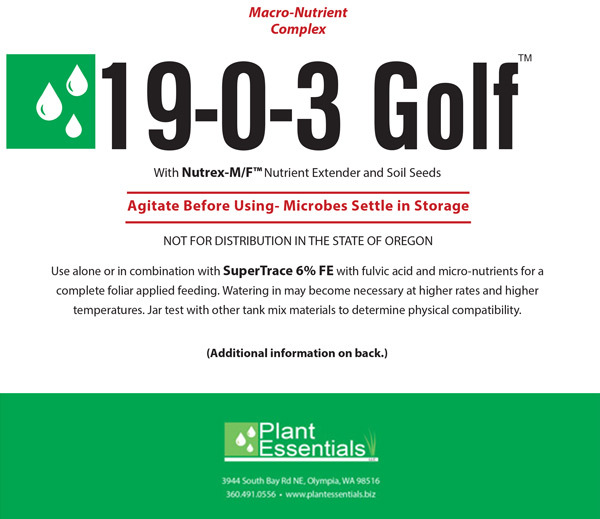 With 19-0-3 Golf, just add water and other tank mix partners like SuperTrace, additional SoilSeeds, TGRs, pesticides, or surfactants, and apply. Adding Nutrex-M/F minimizes the chance for volitization and leaching, and extends the release of nitrogen from urea or ammonium sulfate, making liquid fertilizer application much easier and more efficient. Using at nitrogen rates of .10# to .30# per application are giving great results according to superintendents. The microbial and fulvic acid-carbon amendment additions hasten soluble nutrient uptake and the cycling of organic matter. 19-0-3 Golf makes it possible to go liquid, wall to wall, all year long. Liquid applications make good sense environmentally. Applying smaller amounts of nutrients more often reduces the chance for groundwater contamination, and the N extending components in 19-0-3 Golf add an even greater margin of protection. The cost of any turf product is relative to its ease of use and its benefit. If an honest assessment of the cost of mixing solubles is determined, including the cost of specialized liquid equipment, 19-0-3 Golf will compete favorably and free personnel to do other, more important things. 19-0-3 Golf makes it easy.